Solar installers across Hawaii are searching for inverter technology capable of enduring the damaging moisture, salt, and heat of the Islands. For all residential installa- tions, Haleakala Solar relies on Enphase Microinverters to hold up against the elements. Solar in Hawaii continues to gain popularity as the price of energy remains high. Residents like the Iwamoto family—with large air conditioning needs, multiple fishponds, and a pool—are finding financial relief through solar when it comes time to pay utility bills. But solar systems on the Islands face challenges that many on the mainland don’t, making durable and reliable technology a requirement. found one inverter that is stronger than the rest. Haleakala installs Enphase Microinverters on nearly all residential projects and relies on their robustly-engineered hardware to withstand Hawaii’s harsh microclimates. 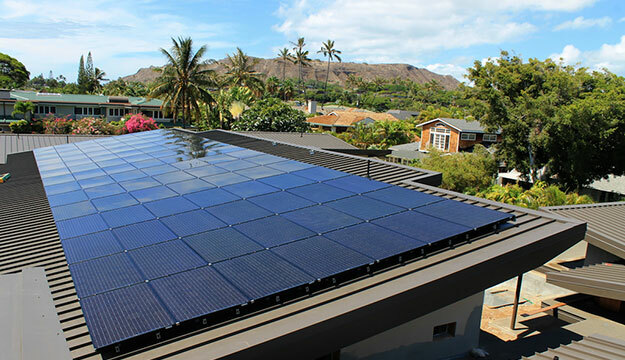 With three generations of customers and nearly 2,500 installations, Haleakala Solar knew exactly which technology to offer the Iwamoto family without worrying that the salty Hawaiian air would rust or ruin. Enphase Microinverters are designed with a NEMA 6 rating to prevent the oxidization of inverters in damaging envi- ronments such as Hawaii. The NEMA rating system defines the standards for various grades of electrical enclosures and signifies their ability to withstand certain environmental conditions. “Many central inverters’ NEMA 3 enclosures are rusting and failing prematurely, causing a large shift from using central inverters to microinverters that will last longer,” said Rudolph. Enphase’s NEMA 6 rating has been the deciding factor in multiple bidding contracts, allowing Haleakala to secure projects throughout the area. Some companies have even begun swapping out central inverters in large commercial projects because they are not NEMA 6 and break down in the weather. “Our founder is extremely passionate about the quality of Enphase Microinverters, so much that we will match a competitor’s string inverter price just so our end customers are given the best inverter solution out there,” said Rudolph. Haleakala installers are proud to provide their community with envi- ronmental benefits that will live on for generations to come. Through Enphase, Haleakala offers their customers quality equipment that is easily monitored and can be remotely updated for future needs. The Islands trust Enphase technology because of its proven reliability year after year.